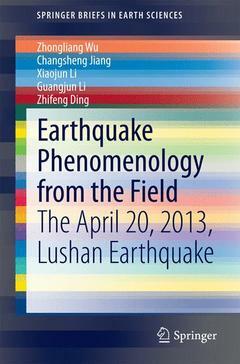 Based on the field investigation and the summary of the published research results of the April 20, 2013, Lushan, Sichuan, China, MS7.0 earthquake, having occurred along the same fault zone which accommodated the May 12, 2008, Wenchuan MS8.0 earthquake, this Brief tries to describe and discuss the special earthquake phenomenology associated with both the local geology and the changing society. Since the occurrence of this earthquake, there have been the scientific debates on (1) the seismo-tectonics of this earthquake which has no primary seismic fault discovered on the surface of the ground; (2) the relation between this earthquake and the Wenchuan earthquake (i.e., whether it can be considered as one of the aftershocks); and (3) how well have been accomplished in the reduction of earthquake disasters, 5 years after the Wenchuan earthquake. This Brief also tries to introduce the studies and practice of Chinese seismological agencies for the reduction of earthquake disasters. Due to language and cultural barriers, such an introduction makes sense not only for English readers but also for Chinese readers. For example, people (abroad) are always asking why there are so many Chinese seismologists working on earthquake prediction. In fact the Chinese wording 'earthquake prediction' has a much wider coverage than that in English. And actually the Chinese approach to (time-dependent) seismic hazard has no systematic difference from outside world in its methodology. The April 20, 2013, Lushan, Sichuan, China, MS7.0 earthquake: overview of the earthquake and its disaster.- Field investigation of the earthquake.- Blind fault and beyond: the seismo-tectonics of the earthquake.- An aftershock of the 2008 Wenchuan earthquake?.- ‘Standing ruins’: locally characterized seismic destruction phenomenology.- From Wenchuan to Lushan: advances and problems.- An earthquake in the transition time between the internet and the micro-blog (Twitter).- Time-dependent seismic hazard in the Sichuan-Yunnan region: earthquake predictability and its limit.- How did a natural disaster change to a manmade accident? Reflection on operational earthquake forecast.- Conclusions and discussion. Dr. Zhongliang Wu received his PhD from Peking University after which he was working at the Institute of Geophysics, China Earthquake administration till 2002. From 2002 until 2007 he was a Professor at the College of Earth Science, Graduate School of Chinese Academy of Sciences. Currently he is the Director at the Institute of Geophysics, China Earthquake Administration. He is also the Editor of Earth Planets and Space. Dr. Xiaojun Li received hi PhD from the Institute of Engineering Mechanics, China Earthquake Administration in 1993. Currently he is the Deputy Director and research scientist of the Institute of Geophysics, China Earthquake Administration. Mr. Guangjun Li worked as a team leader of the Geological Survey Team from 1990 to 1997 and then served as the Deputy Director of the Earthquake Administration of Zigong City from 1997 to 2004 followed by being the Director 2000 to 2004. He currently serves as the Deputy Director of the Earthquake Administration of Sichuan Province. Dr. Zhifeng Ding received his PhD from the Institute of Geophysics, China Seismological Bureau in 1999. He currently serves as an Executive member of the Asian Seismological Commission (ASC) of IASPEI. Dr. Changsheng Jiang received his PhD from the Institute of Geophysics, China Earthquake Administration in 2009. Currently he serves as the vice chief of the R.&.D. Office of the Institute.